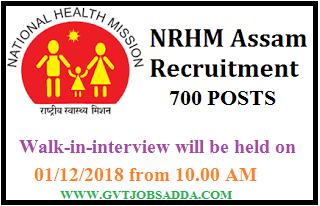 National Health Mission (NHM ASSAM) Has published recruitment notification for the staff nurse under NHM ASSAM 700 posts. Those candidates who are interested & eligible for the recruitment those candidates may walk in interview for the passion of stuff nurse NHM ASSAM 700 posts. Walk-in-interview will be held on 01/12/2018 from 10.00 AM onwards at the State Institute of Health & Family Welfare, Sixmile, Khanapara, Guwahati-22 for engagement on Contractual Basis for the following position under NHM, Assam. 3% seats will be reserved for PWD candidates.